Visiting Jokhang Temple and Potala Palace, the former home of the Dalai Lama, was the most difficult day of the trip so far. The palace was stunning. Perched on a hill overlooking Lhasa, it has all the history, spirituality, and humble grandeur the home of the Dalai Lama might be expected to command. But today, it’s a kind of tomb. A tomb placed on top of something living and patrolled by military police. 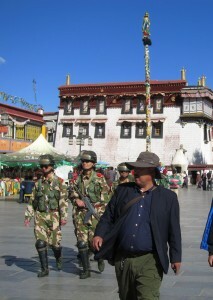 Jokhang Temple, the holiest site in Tibetan Buddhism is even worse – surrounded by soldiers and virtually devoid of monks. The Chinese government is clearly compensating for something in Lhasa and I think it’s public opinion. Soldiers surround and patrol any public space in groups of five. Sporting fatigues, machine guns, grenade launchers and fire extinguishers, they’re ready for anything including pesky self-immolating monks. We were warned multiple times that we couldn’t take any pictures of the soldiers or they’d take our cameras. I guess they aren’t exactly proud of their work there. Sorry, we only have a couple pictures of them, but trust us when we say their presence was intense. Chinese military patrol making its rounds. Police state aside, the sad part of our visit was seeing devoted Buddhists against the backdrop of the empty monastery and the military patrols. Tibetan Buddhists are intensely religious. It’s common for them to visit their local monastery once if not twice a day. During the winter, when farming is not possible, many Tibetans travel to Lhasa at great expense to visit Potala Palace and Jokhang Temple. We saw dozens of people, both young and old, lying prostrate in front Jokhang Temple. We learned that some Tibetans, travel as far as 300 km on foot to Lhasa prostrating themselves every step of the way. The journey takes 3 months and it’s hard to imagine how physically taxing it must be. 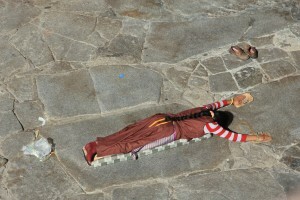 Pilgrim lying prostrate in front of Jokhang Temple. It’s that kind of devotion that terrifies China, as it probably should. They’ve occupied Tibet for over 50 years and are still struggling to assimilate Tibetans. Tibet is a deeply religious nation where it’s against the law to even posses a photo of their religious leader. A foreigner was kicked out for giving a picture of the Dalai Lama to a monk. The monk was imprisoned. 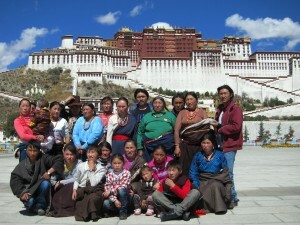 The people of Tibet are warm and welcoming – we saw it in their smiles and their tashi deles (hellos). 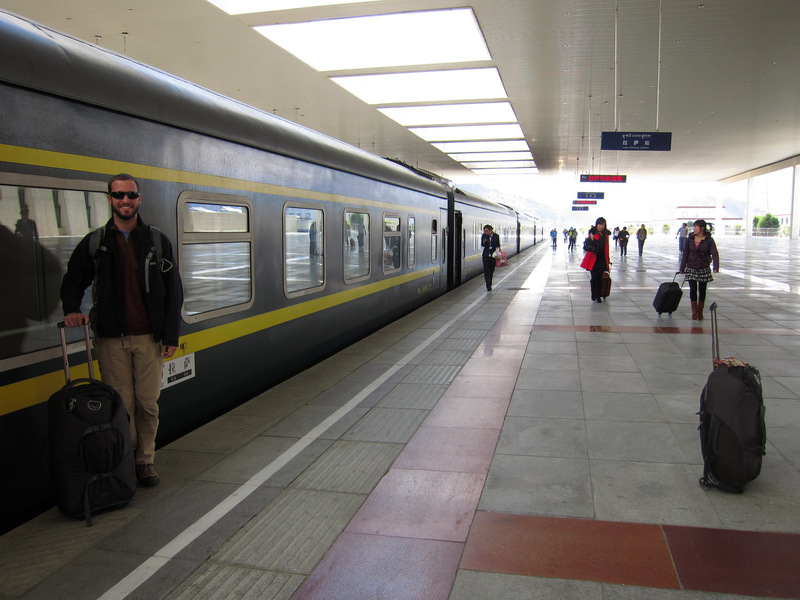 We were told the Chinese government rotates soldiers in and out of Tibet every 30 days so they don’t get a chance to make friends with the locals. We took this photo for the family and asked if we could take one of our own. In Cambodia and Rwanda, we saw the remnants of horrible genocides – experiences we’ll never forget. But Tibet is a crime in progress and a reminder of how lucky we are to have freedom of religion and a separation between church and state. We hope that one day the Dalai Lama can safely return, and that the people of Tibet can practice their religion in peace. 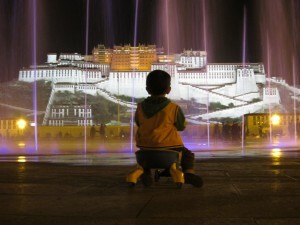 Chinese child watching the light show at the victory fountain across the street from Potala Palace. There are some very dedicated people who are trying to help the Tibetan Nation. Your sad account brings it home why what they are doing matters so much.